It is not often that a Chinese restaurant prompts me (or anyone) to vacuum the car but that was the end result of a vegan degustation dinner at Shu Restaurant in Collingwood. I hasten to add that I was not vacuuming up the food on offer. It was too good for such treatment. Shu specialises in innovative Shichuan cuisine and indeed this was unlike any Chinese food I had had before. 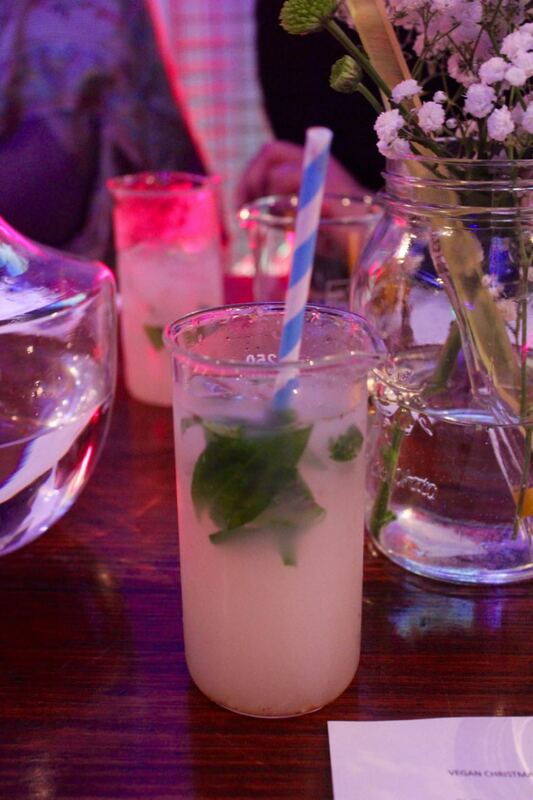 It was a special invitation-only dinner for a group of bloggers and foodie friends of Shu. This post to sing its praises is well overdue. 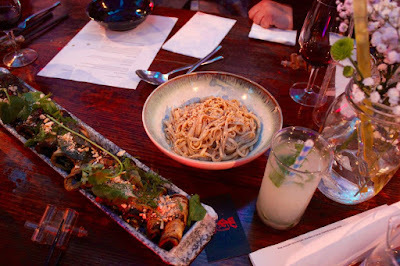 We arrived at Shu on a cold wet night in August for this Christmas in July degustation. Shu is an interesting place with great attention to detail and a preference for recycled materials. 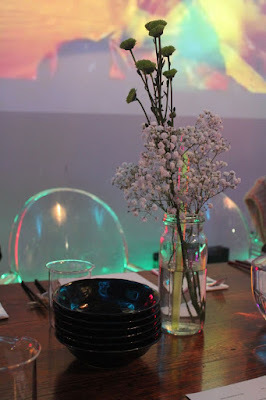 The drinks were in beakers, the chopstick holders are recycled, one part of the wall was covered in old vinyl records and a coloured light show went on while we ate. The light was not in my favour but I encourage you to check out more photos and reflections on the night by Veganopoulous and Cates Cates who were far more punctual than me in posting about the meal. The proprietor, Shu, greeted us warmly when we arrived. I mentioned I was not into really spicy foods and he reassured me I would be fine. Mostly I was. I arrived with Faye from Veganopoulous and we sat with a couple who were regulars and connoisseurs. When I tasted the cocktail that was set before me I was a little startled at how alcoholic it tasted and gave it a miss, given that I was driving and only occasionally drink alcohol. I was a bit sad to avoid it as it was pretty and seemed interesting. Our first selection was a tasting plate of Chilled and Raw dishes. 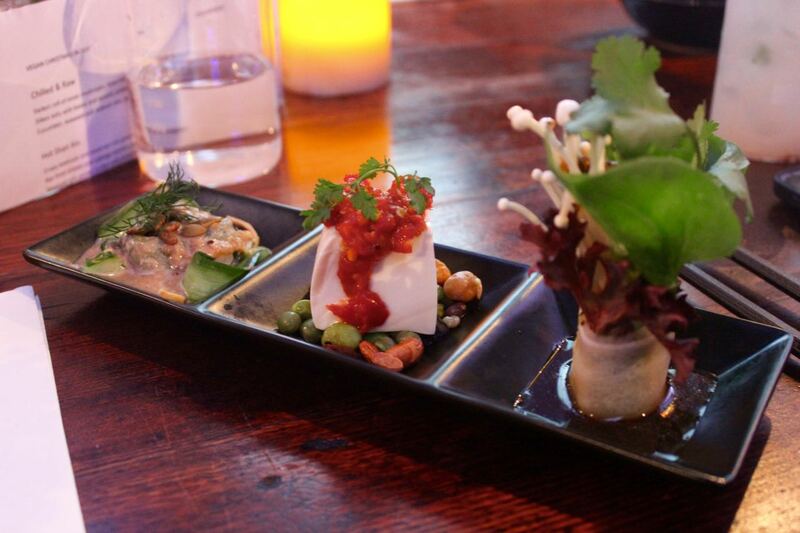 From left to right above: Cucumber, seaweed and soybean skin with spicy tahini and roasted pumpkin seeds; Silken tofu with beans, sprouts and pickled chilli relish; and Daikon roll of enoki mushroom, Asian herbs and lettuce in spicy soy sauce. My favourite of the three was the cucumber, seaweed and soybean skin. The silky creamy mixture melted in my mouth while the seeds added a pleasing crunchy contrast. The daikon roll of enoki mushrooms was spectacular to look at but a mystery as to how to eat it in polite company. I used my fingers, which perhaps was not the most dignified way to eat it. I liked the soft silken tofu and crunchy sprouts but was took busy avoiding the spicy sauce to appreciate it fully. Next came the Hot Dian Xin selection. It was a slightly more substantial tasting plate of Steamed tofu pocket stuffed with preserved mustard greens and peanuts, Pan fried shiitaki and cabbage wonton with pickled chilli jam and Chinese vinegar; and Crispy beetroot and wood ear roll with a green chilli dip. One of my favourite dishes of the night was the Beetroot and wood ear roll. I enjoy spring rolls but the filling is all a bit sameish. Beetroot and mushroom gave such novel and delicious filling. I found the tofu pockets filling a bit gritty and was not a huge fan. I loved the wonton. The home made wrappers were noticeably more prominent and satisfying in texture and flavour than the regular wrappers I am used to and it was a lovely filling. Then started a round of Sharing Plates. 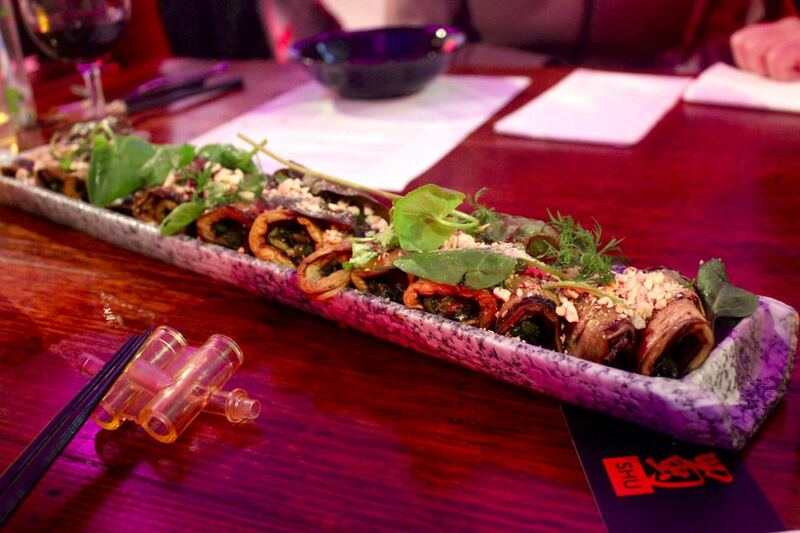 We started with a Pan roasted eggplant rolls with pickled vegetables and roasted cashews. All the food was styled with flair and I loved how these were presented on a long platter. Sadly these were not so much my thing. They were nice but were something I would have enjoyed as part of a platter rather than on their own. And they were a bit too spicy for my palate. Alongside the eggplant rolls were the Home Town noodles. I ate these separately from the eggplant rolls and was surprised that they were cool rather than warm. 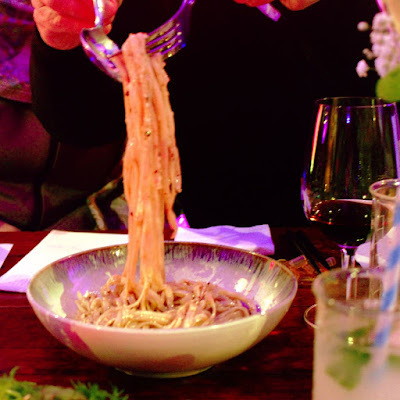 These noodles were served with a light seasoning and sesame seeds. It all sounds rather dull but they were beautifully done and I could have slurped more of these. They had a lovely cooling effect after the spicy eggplant rolls. I am not a huge mushroom fan and was rightly wary of the Mixed Asian mushrooms, ginger and fennel stir fried in a sweet soy sauce. 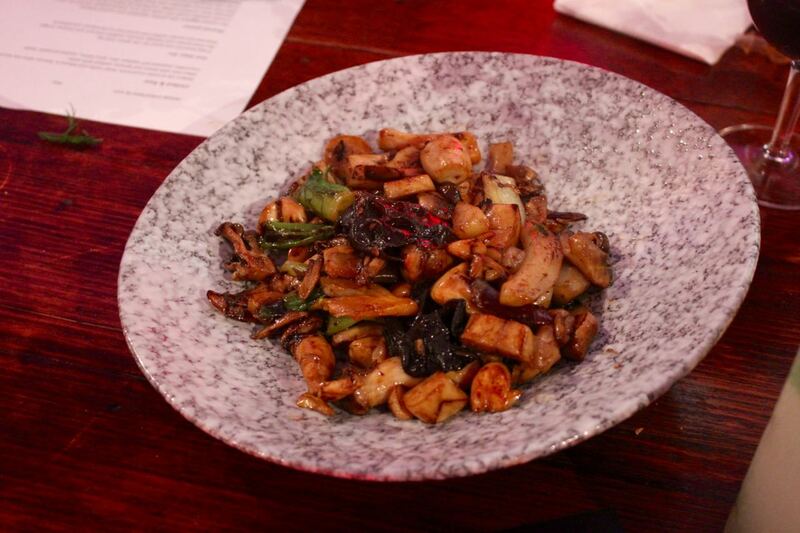 While I enjoyed the opportunity to try a far greater variety of mushrooms than I normally would, I found the dish had too many mushrooms for my liking. I was far more appreciative of the Crunchy coleslaw tossed with seeds and nuts with a Sichuan pepper infused soy sauce. It was refreshing albeit a little spicy. I regret that I don't have a photos worth sharing of the Wok fried seasonal vegetables with dried chilli and Sichuan pepper. I have had such bad experiences of Chinese vegetables covered in an MSG goo that I was so delighted in how fresh and nicely flavoured these vegies tasted. It was one of my stand-out dishes of the night. Our final sharing plate was the Crispy tofu and grilled beanshoots in preserved Pixian bean paste. 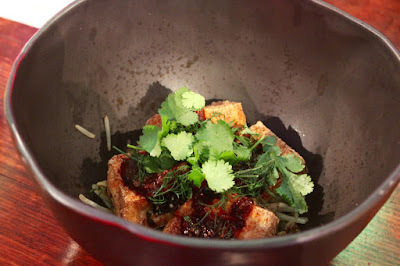 The tofu had crispy edges while being meltingly soft inside and was lovely. 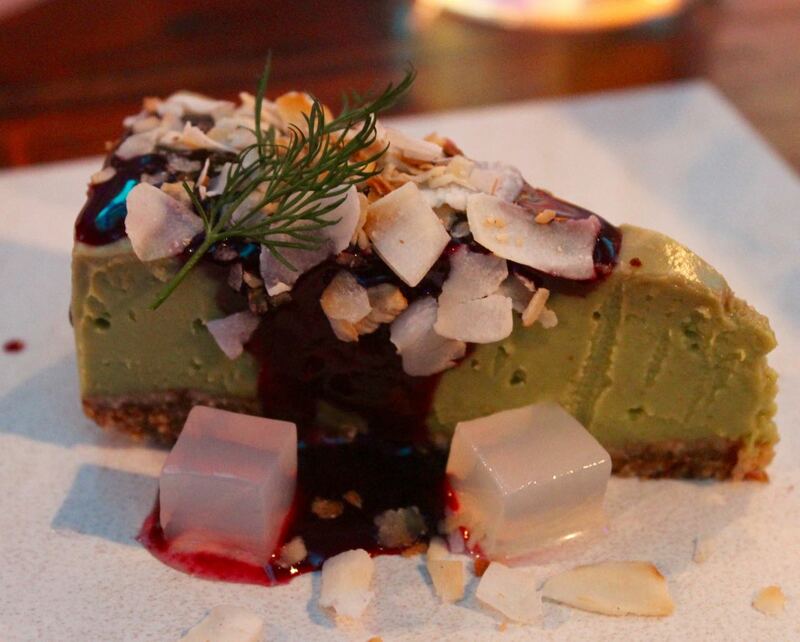 Finally we were served a Raw avocado cheesecake with blackberry syrup and toasted coconut chips. This was a really nice light dessert at the end of a large meal. It was lightly sweetened with a pleasing tang to it. The talking point was the jellied fruit cubes. In my notes I have written "lychee and agar cubes???" and can only surmised that this was what a guest surmised. It was a stunning and memorable end to a great dinner. 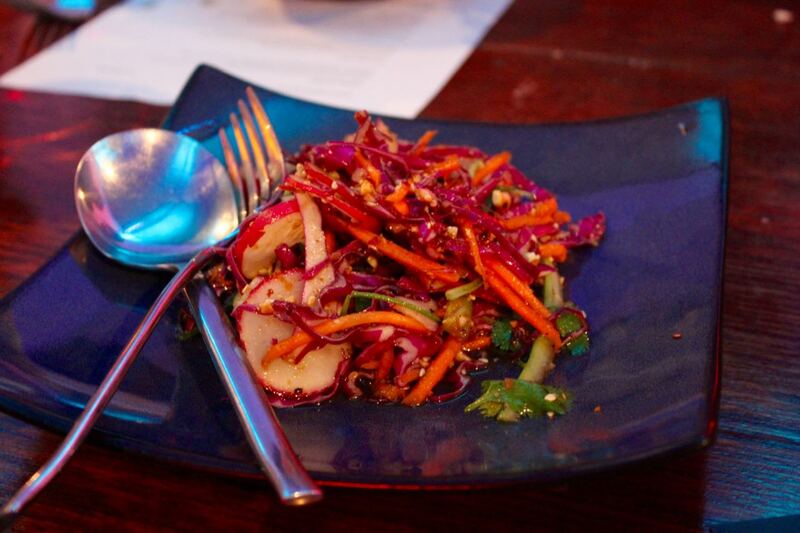 The degustation introduced me to Asian food in a new and exciting way. There was far more spice than I am used to but it was done well and I coped - mostly! All the dishes were quite light and I was full but not stuffed to the gills at the end. I would definitely return for a meal and recommend it to others. You might remember that I started the post talking about vacuuming the car. At the end of the meal I offered Cindy and Michael a lift home. When I took out the child seats I was horrified at the crumbly mess beneath them. I covered it up with a rug and vacuumed the car soon after. Disclosure: I was invited to Shu by the proprietor and paid by the honest box at the end of the meal. I was not obliged to write a positive review and all opinions are my own. I wish I had those plates and bowls! I am not that into Oriental cuisine, but Johanna this I would be most happy to indulge in and its spicy too, looks utterly delicate, gorgeous and tasty - really everything does, so I am jealous! Now it makes sense why you were vacuuming, what do you expect with a little one :) And your pics are fab, really. Thanks Shaheen - I am sure you would enjoy this meal - and you are right about the crumbs in the car - but I don't think I have ever discovered so many crumbs under Sylvia's seat before - don't know if she is getting messier or if I am getting fussier! Thanks Sally - I think shu regularly holds dinners from what I have seen around the web so maybe you will get there sometime. 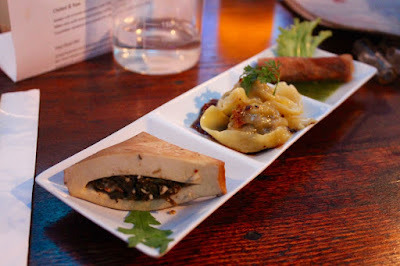 I really enjoyed this dinner, Shu are holding a raw vegan night twice in November. I was surprised with the cold noodles too, but more surprised at how much I loved them! Sounds like a great meal! Very nice decor too. Oh wow - how good is that degustation?! Nice to see someone doing vegan food in a fancy and innovative way. London definitely needs a Shu! Thanks Joey - it is pretty amazing - every city needs a Shu!!!! I like how they try to refurbish things, very cool. The food looks amazing! I looooove enoki mushrooms and think that a daikon roll would be so tasty with them in it! I would have really enjoyed all of the mushroom dishes. Yum. They really make some interesting things, the wrappers especially. WOW! It all looks so delicious!